In nature, Cattleya grow on rocks and trees with their roots exposed to the elements. Their roots are accustomed to good air circulation and they need to dry out quickly after watering. The LECA pebbles in our Hydroponic System are perfect for this - if you allow enough time for the system to dry out properly between waterings. Cattleya transplants might need a little time to adjust to their new home. Acclimating your plant to hydroponics is going to be a gradual process. It's definitely worth the effort - because once your plant is acclimated (developed water roots) it's going to be much stronger and more durable. 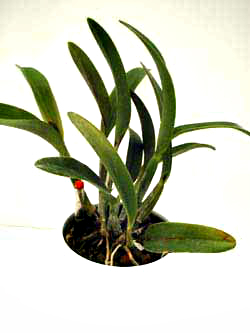 Cattleya's are high light growers so your new transplant is going to need a window that gets an hour or so of sun. Avoid hot, direct for longer however. 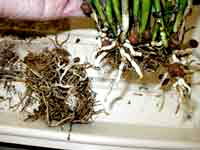 Roots on these plants need air as much as they need water to grow. Give them too much water and they will suffocate. Start by giving your plant with very little water and then work your way up to the full amount. Repeat this process 1-2 times a week with no standing water at the base of the plant. After 3-4 weeks you can start using the water gauge for measuring how much to water. Water plant until water gauge moves - then stop! Waiting until system is completely dry between waterings is important. We even recommend letting your plant sit dry for several days so air gets to the roots. If your plant isn't using up all its water in 2 weeks, dump out the water and force a dry period of a week or so before rewatering. 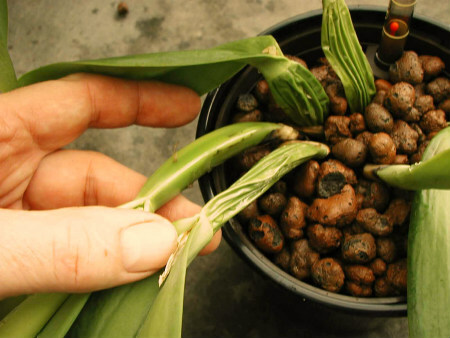 New growth tips means your plant has adapted to hydroponics and the roots are active. Still allow plenty of time for the system to dry out completely between waterings. It's always better to error on the dry side. 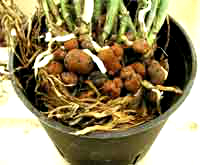 Healthy new roots have a grey color tone and green tips. Roots growing on top of the pebbles (and sometimes outside the pot!) are normal. 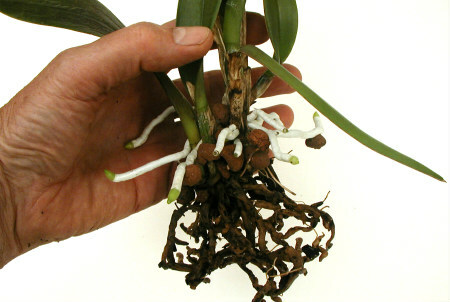 Many Cattleya abandon their old root system and form entirely new roots after transplanting. 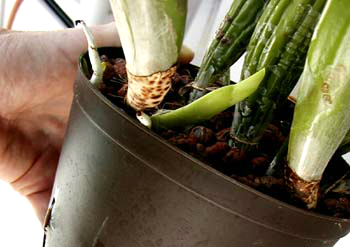 That's why it's imperative to not over water new transplants - there's simply isn't enough roots to absorb the moisture. This photo was taken about a month after transplanting (during active growth season). Notice the vigorous new hydroponic roots forming around the LECA pebbles. Sometimes Cattleya take their time adapting to the system. This is especially true for Laliea varieties. Have patience - we've seen Cattlyeas that look really bad make full recoveries - don't give up! If your new transplant isn't doing well, it's having problems developing new roots. The first sign is a wilted plant. This plant is dehydrating because the roots aren't collecting moisture and sending it up to the stems and leaves. 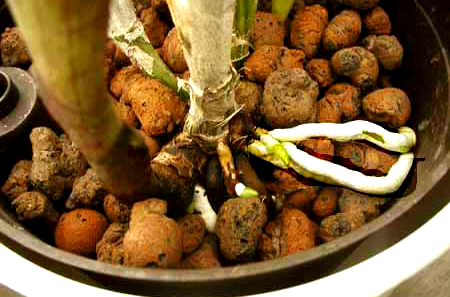 Your plant is suffering because the roots are dying and can no longer send moisture up the stems and leaves. Dying roots need more air, not more water. Gently remove plant from culture pot. 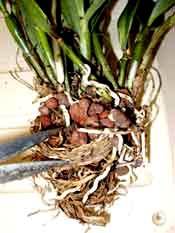 Roots at top are healthy - roots toward bottom are too wet and rotting. 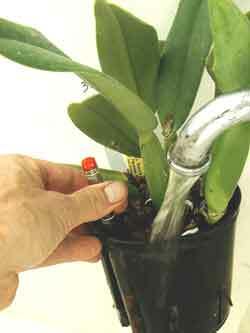 Your watering routine is back to pouring a KLN solution (2 TBLS per quart of water) through the root system at the sink. No standing water at the base until you see new growth. New growth signals the plant is recovering! Now you can start watering to 1/4 on water gauge - and waiting until system is completely dry before rewatering.